‘In each generation, there is this certain wisdom of the ages that gets reburied in the fleeting drivels of modernity; then, like a diamond in the rough, it is yet again unearthed by a very small minority who not only restores it, but also polishes it and presents it as something new, something highly valuable and refreshing as understood by the current.’ — Criss Jami, Healology. 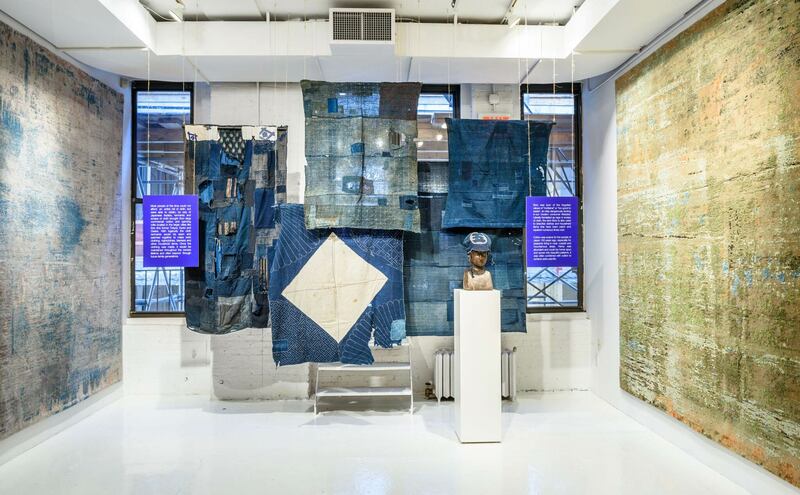 In October 2016 Jan Kath by Kyle and Kath – the New York City showroom of the eponymous brand – presented ‘Boro: The Art of Repurpose’, an innovative presentation of authentic Boro garments paired with the firm’s like inspired carpet collection as well as the contemporaneous bespoke Boro fashions of Kuon. Spanning the intertwined realms of interiors, history, and fashion the exhibition revives the wisdom of the ages as it were, presenting it as one must, polished and now in high regard. 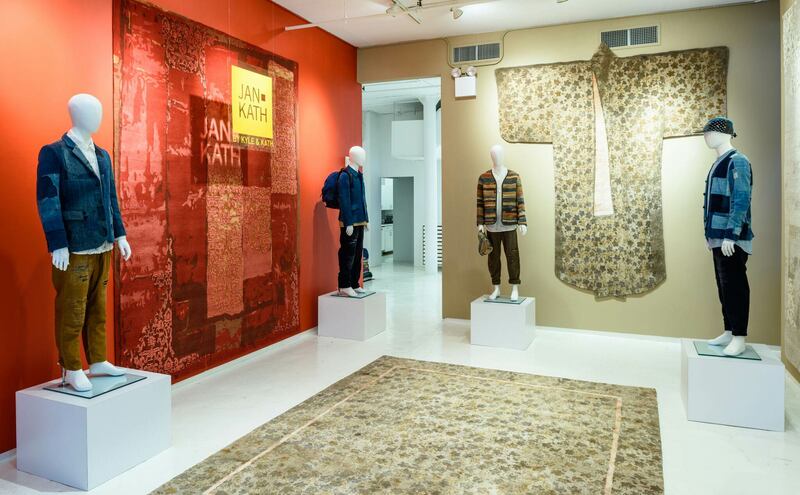 Traditional Boro textile garments (on loan to Jan Kath from a private collection) displayed in juxtaposition to the firm’s contemporary carpet collection by the same name. | Image courtesy of Jan Kath. Of course, Boro is not a discovery of Jan Kath’s nor is the firm’s appreciation of the form unique in the carpet world. In fact David Sorgato, an antique carpet and textile dealer of some renown, published a tome on the subject back in 2006. What Jan Kath has done however is to polish and make new again, something that in truth was never old. 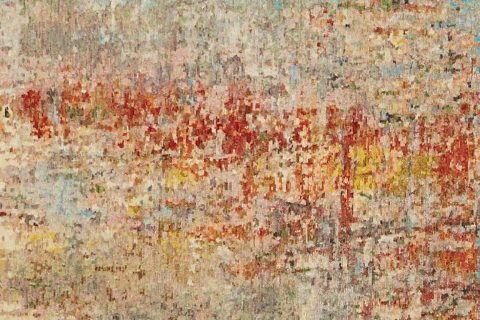 Boro, much like handmade carpets as well, are objects which embody a variety of Japanese (and other) principles. Kintsukuroi – a manner of repair which treats breakage and repair as part of the history of an object, rather than something to disguise and wabi-sabi – a traditional Japanese aesthetic constituting a world view centred on the acceptance of transience and imperfection. 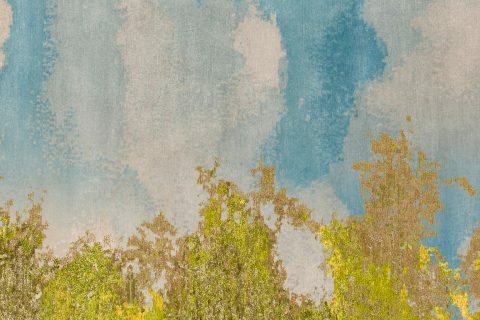 For those well versed in Buddhism this notion of impermanence is well understood and furthermore, relates directly to the country of Nepal where the carpets in this exhibit are made. Mannequins dressed in contemporary bespoke Boro clothing from ‘Kuon’ ask ‘What kind of exhibit are we in?’ as they stand proud against an assortment of bold Jan Kath carpets including the whimsically shaped ‘Dress Carpet’ on the far wall. | Image courtesy of Jan Kath. As an American by birth, pedigree, and often by action the idea of repurpose is both familiar to me owing to my lower class upbringing in a community surrounded by farms and something to be shunned, in favour of the new and shiny thanks to American Brand Global ConsumerismTM. Of course I, you, and the next generation want something wholly our own, but just as this article opened with the premise of cycles, so too must we realize very little is ‘conjured from the ether’ as I was once told. 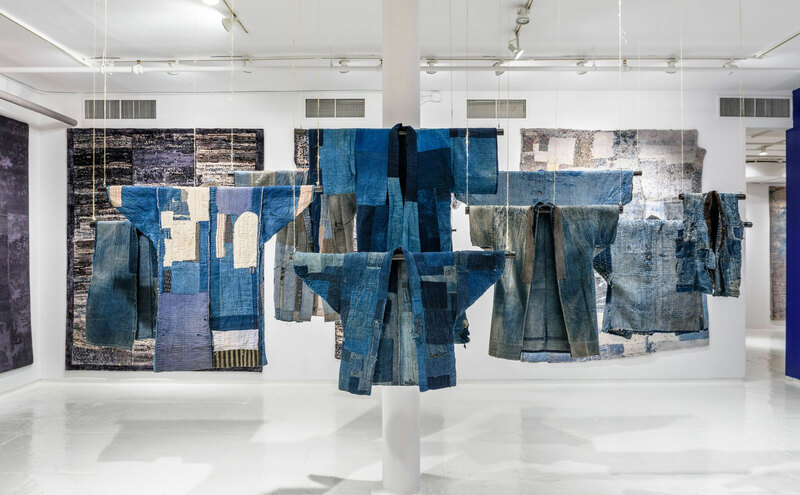 Moreover, society en masse has a fascination with preservation when widely agreed upon aestehtics are involved and so it is the work of fashion designer Shinichiro Ishibashi of KUON in this exhibit which raises the most intriguing questions. As a bespoke Japanese men’s fashion brand his collections are created not simply by repairing Boros, but by disassembling the textiles into pieces, then reconstructing them it in order to craft modern, one-of-a-kind fashions. The show was very good and pulled in a nice crowd throughout the month of October. Overall the show was very, very well received. The head of textiles at the Cooper Hewitt was here at the opening along with many clients and collectors who all enjoyed the mixed media concept of the presentation. — Kyle Clarkson, Partner at Kyle and Kath. This manner of construction, both true to the origins of Boro, and provocative to the preservationist is – once again – not unknown to the world of rugs and carpets. By example one needs only examine the original patchwork carpets out of Turkey in the mid-to-late aughts of this century to understand how repurpose and re-use relate directly to rugs and carpets aesthetically, not to mention functionally or technically. 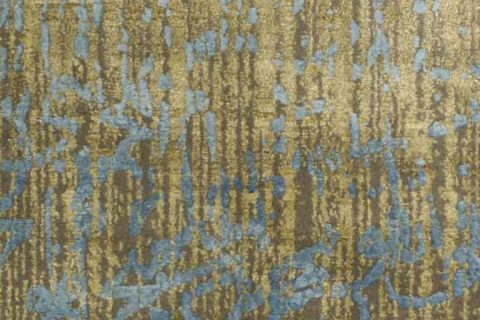 Having been fascinated by the history of Boro for many years, Jan Kath created a collection of carpet designs which implement the aesthetics the original art form while enhancing its impact and beauty to a new level all the while adapting it to the commercial demands of modern decorative carpet consumers. By using the concept of Boro the firm projects the illusion of deconstruction and reconstitution through the finest natural materials of silk, handspun Tibetan highland wool and nettle. Again, to quote the press release: ‘This exhibit harmoniously combines the worlds of interior, fashion and antiques for a comprehensive view on the ancient art form of Boro.’ Moreover, it illustrates expertly the interconnected, inspirational, and cyclical nature of design as a whole. 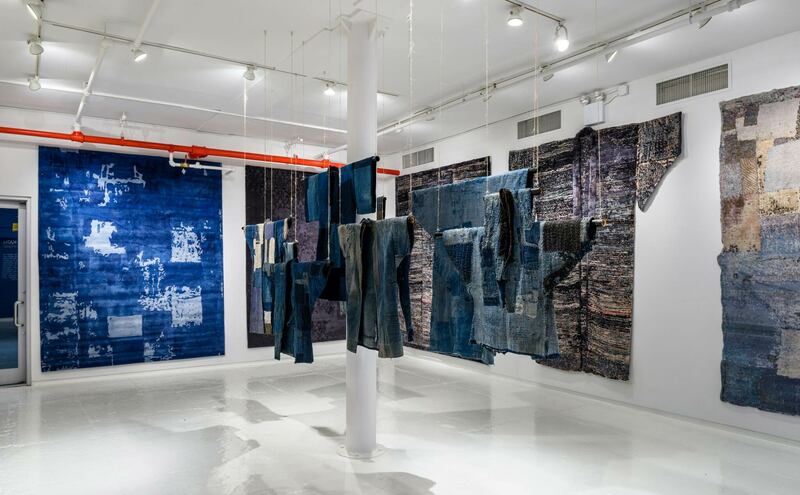 ‘Boro: The Art of Repurpose’ closed at the end of October at Jan Kath New York with the carpets traveling onward to 2017’s ‘A Family Affair’ in Bochum, Germany. Due to the success of the show, the entire exhibit is now traveling to various Jan Kath outposts worldwide. For more information please contact your local Jan Kath stockist or showroom. Previous Post:Istanbul Carpet Week | A Must! Next Post:Fort Street Studio Presents… . A candid look at photorealism in handmade carpet design and manufacture.